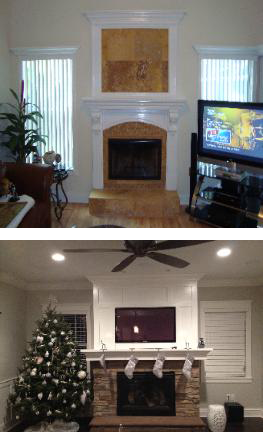 Custom Fireplace Mantels in Tampa, St. Pete, Clearwater and beyond! There is something different about a room that features a fireplace. Besides providing heat, a fireplace with an updated surround and mantel creates a feeling of warmth and comfort for the homeowners and their guests alike. Custom mantels reflect the individual taste and style of the homeowner and set the theme of the room. Mantels can be traditional or ornate, large or small. They can be modern or antique looking. Our designs are as varied and unique as the homeowners that choose them. We work with wood, brick, tile, marble, granite and more. We can build an entire wall system around your fireplace or incorporate bookshelves. We can enclose a flat screen television, display your art collection or family photos, create a brand new mantel and surround, you name it, we can build it. The choices are endless and we can also offer ideas and suggestions to enhance your current design. Contact Gloger Construction today and let us build your dream mantel and surround. Copyright © 2014 - 2019. All rights reserved. Gloger Construction, LLC. All Rights Reserved.